The DA’s hopes of the report being released before the May 8 elections have, however, been dashed. Public Protector Busisiwe Mkhwebane said the scope of her investigation into President Cyril Ramaphosa may be widened to include allegations of money laundering, City Press has reported. This has, however, dashed hopes from the DA that the report would be released before the May 8 elections. DA leader Mmusi Maimane met with Mkhwebane last Tuesday in the hope of speeding the process up. The party felt the case was taking too long as a complaint was lodged over five months ago. In a statement last Tuesday evening, Maimane said his meeting with Mkhwebane had raised further concerns about the allegedly corrupt relationship involving President Cyril Ramaphosa and his family with controversial facilities management company Bosasa. He claimed his discussion with Mkhwebane confirmed the DA’s claim that the president and his son were involved in improper business dealings with the company, though he did not provide details to prove that this was in any way Mkhwebane’s view, and not simply his own assertion. On Saturday, Maimane had said it was “five months to the day since President Ramaphosa misled parliament about the conflict of interest between him, his son, Andile Ramaphosa, and Bosasa – the company that has been actively bribing ANC officials for almost 20 years”. He had also announced his intention to meet with Mkhwebane on Tuesday so that he could be updated on the investigation into Ramaphosa and his son’s relationship with Bosasa “and the clear conflict of interest that exists between the Ramaphosa family and Bosasa”. Maimane said he had also written to the state capture commission’s chair, Deputy Chief Justice Raymond Zondo, to ask for the president to be subpoenaed to appear before the commission over his and his family’s alleged conflict of interest with Bosasa. 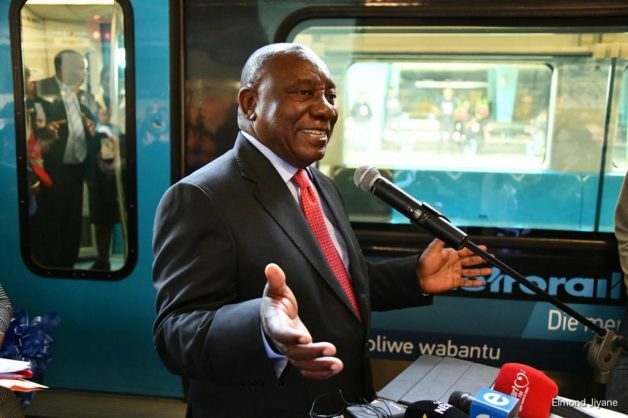 He listed Ramaphosa’s R500,000 “donation” from Bosasa CEO Gavin Watson towards his campaign to be elected ANC president; that Andile Ramaphosa had a contractual agreement with Bosasa for “advisory services”, through which he earned over R2 million in a little over a year; that Ramaphosa had told parliament he had seen that contract, and that it was all supposedly above board; and that Andile Ramaphosa’s business partner, a Chinese energy company, attempted to secure a R400 million kickback from an Eskom loan in January last year – at a time when his father Cyril Ramaphosa was heading up state-owned entities, including Eskom. He added that he had requested to view the president’s declaration of interests since his election in February 2018. He said on Tuesday that his meeting with Mkhwebane had “confirmed” that “the nature and extent of the relationship between the Ramaphosas and Bosasa ran much deeper than initially thought”, and that was why she had not been able to finalise her investigation by the end of February. He said the public protector had confirmed she had so far engaged Ramaphosa, his CR17 campaign team and Bosasa; had subpoenaed bank statements and attorneys on each side; and requested an affidavit from Andile Ramaphosa on his version of events. Maimane called for the removal of the entire ANC on May 8 and for them to be replaced with a DA-led government, which would have “zero tolerance” for corruption.